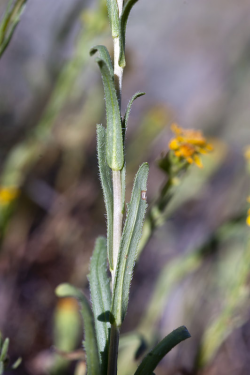 Hall’s tarweed (Deinandra halliana). Illustration from Abrams and Ferris, Vol. 4, 1960. Hall’s tarweed (Deinandra halliana) seedling. Tumey Hills (Fresno County, CA), March 11, 2017. Copyright © 2017 Chris Winchell. Hall’s tarweed (Deinandra halliana) habitat. Vicinity of Parkfield (San Luis Obispo County, CA). Barren alkaline clay soil on a south-facing slope. Associated with California macrophylla. March 28, 2013, Copyright © 2015 Chris Winchell. Hall’s tarweed (Deinandra halliana) habitat. Tumey Hills (Fresno County, CA). Common on alkaline clay slopes in the Tumey Hills region during 2017. Often associated with multiple rare taxa including Lepidium jaredii, California macrophylla, and Madia radiata. March 11, 2017. Copyright © 2017 Chris Winchell. 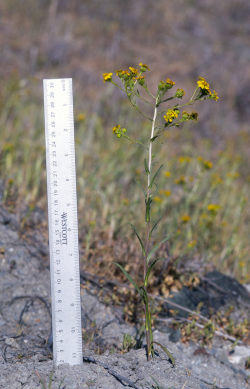 Hall’s tarweed (Deinandra halliana) growth habit. Vicinity of Parkfield (San Luis Obispo County, CA), March 28, 2013. Copyright © 2015 Chris Winchell. Hall’s tarweed (Deinandra halliana) stem and leaves. Vicinity of Parkfield (San Luis Obispo County, CA), March 28, 2013. Copyright © 2015 Chris Winchell. Hall’s tarweed (Deinandra halliana) inflorescence. Vicinity of Parkfield (San Luis Obispo County, California, US), March 28, 2013. Copyright © 2015 Chris Winchell. Hall’s tarweed (Deinandra halliana) inflorescence. Vicinity of Parkfield (San Luis Obispo County, CA), March 28, 2013. Copyright © 2015 Chris Winchell. 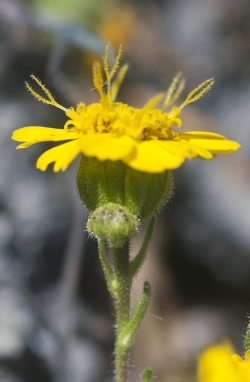 Hall’s tarweed (Deinandra halliana) ray cypsela. Vicinity of Parkfield (San Luis Obispo County, CA), March 28, 2013. Copyright © 2015 Chris Winchell. Locally abundant on open slopes, grasslands, chenopod scrub, woodlands, or sink edges; in vertic clay, ± alkaline soils, or rarely on serpentine; 260–1000 m (Baldwin and Strother 2006, Baldwin 2012, CNPS 2013, CNDDB 2018). Self-sterile annual herbs. Stems 1.5–12 dm, erect, hollow in larger plants, glabrous ± proximally, glandular-puberulent and soft-hairy distally. Basal rosette weakly developed but evident; proximal leaves linear-lanceolate, entire to serrate, margins and midribs sometimes scabrous or bristly-ciliate. Heads in open, flat-topped clusters, pedunculate; involucres narrowly hemispheric; paleae in 1 series between ray and disk flowers. Ray flowers 8–14, rays 5–10 mm, deep yellow. Disk flowers 28–60, staminate, anthers yellow or brownish. Pappus absent or rudimentary. 2n=20 (Baldwin and Strother 2006, Baldwin 2012). 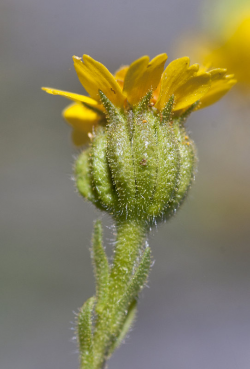 Hall’s tarplant is similar to showy golden madia (Madia radiata Kell., CRPR 1B.1), with which it can co-occur (CNDDB 2018). Hall’s tarplant has phyllaries stalked-glandular and is generally sparsely nonglandular-hairy, while showy golden madia has phyllaries long- to stiff-hairy and glandular-pubescent with glands yellowish or purple. Showy golden madia has ray cypselae compressed and beaked, while Hall’s tarplant has ray cypselae with a dorsal hump ≥ the beak (Baldwin and Strother 2006, Baldwin 2012). Endemic to the western San Joaquin Valley (w SnJV) in Fresno County, California, and the Inner South Coast Ranges (SCoRI) in San Benito, Monterey, and San Luis Obispo counties, California (CNPS 2017, CNDDB 2018). Keck placed the new species in section Olocarpha DC. (3), characterizing it as “the most unique of the ten species in its section,” though it shared a chromosome number [2n=20] and other inflorescence characters with H. angustifolia [= D. corymbosa (DC.) B. G. Baldwin] (4). Barry D. Tanowitz (1982) included Hemizonia halliana in an emended circumscription of section Madiomeris Nutt., with 13 other species “allied to [D. corymbosa]” and “distributed in the foothills and valleys from central California into Baja California Norte.” He characterized members of the group as having “one or more of the following” characters: an annual habit, beaked ray cypselae, leaves and phyllaries lacking apical spines, and paleae generally fused into a peripheral ring. Tanowitz observed that Hall’s tarplant had populations “widely scattered” and could be “locally abundant in heavy adobe clay soils on flood plains and occasionally on serpentine,” in good rainfall years, while barely making an appearance in poor rainfall years. He remarked that the plant was “particularly abundant in grazed fields,” though “numerous populations probably have been eliminated as the result of extensive cultivation.” At the time of his writing, Tanowitz noted that San Benito County had not been collected extensively, causing him to suspect that additional populations awaited discovery there. Research on the North American tarweeds (Madiinae) conducted during the 1990s resulted in a taxonomic revision that reflected the new understanding of phylogenetic relationships within this group (Baldwin 1999). Hemizonia DC. sensu Keck was shown to be non-monophyletic, requiring its division into three genera: Hemizonia, Centromadia, and a reinstated Deinandra Greene (5). 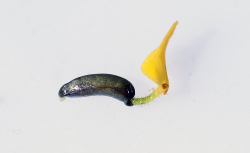 Molecular analysis revealed that “Deinandra is more closely related to Calycadenia, Centromadia, Holocarpha, ... than to Hemizonia in the strict sense” (Baldwin and Strother 2006). The CNDDB (2018) cites 56 known occurrences, all presumed extant. San Benito County supports 26 occurrences that fall within five USGS quads. Fifteen occurrences fall wholly or partly on Bureau of Land Management (BLM) lands. Ca. 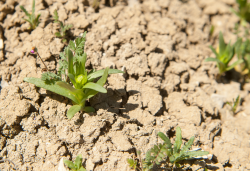 21 new occurrences were added after surveys were conducted in 2015, 2016, and 2017 (a very wet year) by BLM personnel, with hundreds of thousands of plants observed, primarily on vertic clay soils. In a number of these occurrences, Hall’s tarplant is associated with other sensitive species, including the morphoogically similar Madia radiata.Though threats to these occurrences are unknown, eight are considered to be in excellent condition. Fresno County supports 22 occurrences falling within ca. eight USGS quads, with two of those straddling the San Benito County line. Fourteen of these occurrences are located wholly or partly on BLM lands. 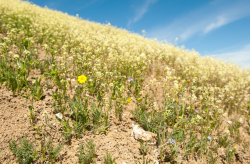 Many of these occurrences were surveyed for in 2015 and 2017, at which time tens of thousands of plants were documented with one occurrence numbering “in the millions.” Threats include recreational vehicle use and impacts from grazing. Monterey County contains three occurrences, falling within three USGS quads, with one occurrence straddling the San Benito County line. These occurrences are based on old specimens, and only one has been relocated. This occurrence falls partly on BLM land, with thousands of plants observed in 1998. Threats here include grazing, trampling, erosion, and recreational use. Ownership of the other two occurrences is unknown, therefore fieldwork is required to document current conditions. Four occurrences are located in San Luis Obispo County, falling within two USGS quads and including the type locality. The most recent surveys (1998) documented hundreds of plants, with threats including grazing, non-native species, trampling, erosion, development, and agriculture. One occurrence based on old collections near Cottonwood Pass is in the vicinity of the Kern, Kings, Monterey, and San Luis Obispo county lines. Fieldwork is required to determine its status. 1. Hemizonia: Greek hemi, half, and zonia, zone, the bracts but half-enclosing the fruit. Dr. Harvey Monroe Hall (1874–1932) was an American botanist and professor associated with UC Berkeley and Stanford University. An authority on the Asteraceae, he conducted “pioneering biosystematic investigations” along with others “on various lineages of Madiinae” (Baldwin 2006, Wikipedia 2018, JSTOR 2018). 5. Deinandra: Greek, fierce man (Baldwin 2012). Abrams, L. R. and R. S. Ferris. 1960. An Illustrated Flora of the Pacific States, Vol. 4. Stanford University Press, Stanford, CA. Baldwin, B. G. 1999. 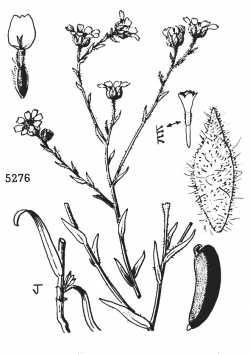 New combinations and new genera in the North American Tarweeds (Compositae–Madiinae). Novon 9(4):462–471. Baldwin, B. G. 2006. Contrasting patterns and processes of evolutionary change in the Tarweed-Silversword lineage: revisiting Clausen, Keck, and Hiesey’s findings. Annals of the Missouri Botanical Garden 93(1):64–93. Baldwin, B. G. 2012, Deinandra halliana, in Jepson Flora Project (eds.) Jepson eFlora, http://ucjeps.berkeley.edu/eflora/eflora_display.php?tid=77578 [acc. 23 Aug 2018]. Baldwin, B. G. and B. L. Wessa. 2000. Origin and relationships of the Tarweed-Silversword lineage (Compositae–Madiinae). American Journal of Botany 87(12):1890–1908. Baldwin, B. G. and J. Strother. 2006. Deinandra halliana, in Flora of North America Editorial Committee, (eds.) 1993+. Flora of North America North of Mexico. 19+ vols. New York and Oxford. Vol. 21. http://www.efloras.org/florataxon.aspx?flora_id=1&taxon_id=250066468 [acc. 21 Aug 2018]. 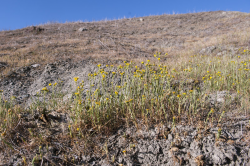 California Native Plant Society (CNPS), Rare Plant Program. 2018. Deinandra halliana. Inventory of Rare and Endangered Plants (online edition, v8-03 0.39) [treatment last updated Nov 8, 2017]. California Native Plant Society, Sacramento, CA. http://www.rareplants.cnps.org/detail/150.html [acc. 21 Aug 2018]. California Natural Diversity Database (CNDDB). 2018. [Internet]. California Department of Fish and Wildlife [acc. 16 May 2018]. Carlquist, S. 1959. Studies on Madinae: Anatomy, cytology, and evolutionary relationships. Aliso 4:171–236. Carlquist. S. 2003. Tarweeds & Silverswords: Evolution of the Madiinae (Asteraceae). Missouri Botanical Garden Press, St. Louis, MO. Clausen, J. 1951. Stages in the Evolution of Plant Species. Hafner Publication Co., New York, NY. Crins, W. J. and B. A. Bohm. 1990. Flavonoid diversity in relation to systematics and evolution on the tarweeds. Annals of the Missouri Botanical Garden 77(1):73–83. JSTOR. Global Plants. Harvey Monroe Hall. https://plants.jstor.org/stable/10.5555/al.ap.person.bm000003352 [acc. 23 Aug 2018]. Keck, D. D. 1935. Studies upon the taxonomy of the Madinae. Madroño 3(1):4–18. Keck. D. D. 1959. Hemizonia. Pp. 1117–1124, in A California Flora, by P. A. Munz. University of California Press, Berkeley, CA. Keck, D. D. 1960. Hemizonia. Pp. 172–184, in An Illustrated Flora of the Pacific States, Vol. 4, eds. L. R. Abrams and R. S. Ferris. Stanford University Press, Stanford, CA. Kyhos, D. W., G. D. Carr, and B. G. Baldwin. 1990. Biodiversity and cytogenetics of the tarweeds (Asteraceae: Heliantheae–Madiinae). Annals of the Missouri Botanic Garden 77:84–95. Lewis, D. and L. K. Crowe. 1958. Unilateral interspecific incompatibility in flowering plants. Heredity 12:233–256. Matthews, M. A. and M. Mitchell. 2015. The Plants of Monterey County: An Illustrated Field Key, 2nd ed. Monterey Bay Chapter, California Native Plant Society, Carmel, CA. Tanowitz, B. D. 1982. Taxonomy of Hemizonia sect. Madiomeris (Asteraceae: Madiinae). Systematic Botany 7:314–339. Twisselmann, E. C. 1956. A flora of the Temblor Range and the neighboring part of the San Joaquin Valley. The Wasmann Journal of Biology 14(2):161–300. Wikipedia. 2018. Harvey Monroe Hall. https://en.wikipedia.org/wiki/Harvey_Monroe_Hall [acc. 23 Aug 2018].